I was rather looking forward to coming up eye to eye with the king of the jungle. My mother had done the pre-lion build-up on the trip to Blackpool Tower Zoo. "You'll see they even have a lion!" I was, it had to be admitted, a little apprehensive about being in the same space as a real lion. After all, he did have the means to rip me to pieces with his bare paws. A six-year-old human would be no match for a real lion. I was disappointed at the pitiful lethargy of the giant cat. He was slumped in a cage. He looked gloomily around, yawning with a glazed look of prolonged sensory deprivation. All roaming was limited to uncomfortable shifting of cramped up limbs. If he had been stuffed, with a roar on cassette loop, I might have been more impressed. I was left with a sensation of intense sadness. Yes this was much better. The owners of the progressive zoo had imagined animal heaven. Lions were free to roam. The animals seemed much better kept, they could even stretch their legs, and bound around. Hunting, of course, was unnecessary as the keepers kept all the animals healthy with carefully measured, scientifically designed diets. Breeding programs were a success. 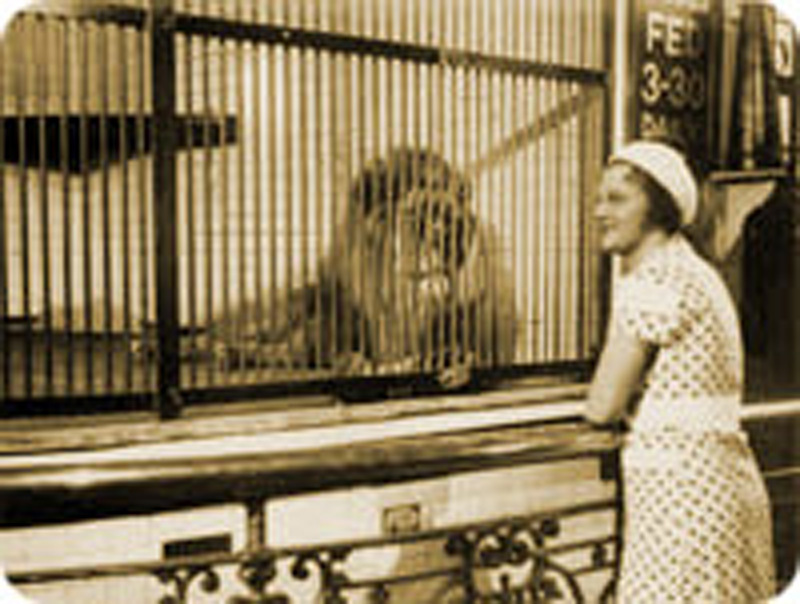 In some enclosures, animals of different species were even mixed. We could see zebra with zebu, and the odd antelope. Marvellous how animals of such diverse species could manage to live in harmony for the tourists' greater pleasure. Perhaps the animals were happy to make new exotic friends. I am not sure if animals make friends. We were mightily impressed at the great efforts made to educate children. We learnt how the zoo was responsible for preserving endangered species. Out in the wild in Africa, the locals were often inhumane poachers. Thank God for the World Wild Life Fund! The Panda was doing a marvellous job in the preservation of African biodiversity. I would like to imagine that in the future our children will look at the enclosures in which past generations were kept as absurd anachrosnism. They will be shocked at the controlled diets. I was brought up with stories of discovery, of adventurers. There have been moments in my life when I have looked on at my peers with astonishment. Whatever happened to grand narrative? I was shocked that on finishing university, a large number of my fellow 'students' appeared to have their lives mapped out. They had apparently been studying to get what was called 'a good job'. What the hell was 'a good job'? History degrees were apparently perfect preparation for young people to become accountants. What the hell was an accountant? I met a 'successful' brand manager while working (playing) in Public Relations. "I hate my job," he told me, "but it's too late now, with the mortgage and all." He would never perhaps learn of his true nature. He had become too dependent on his comfort. He left me with a sensation of intense sadness. Success = feeling joy. It's also nice to be able to support oneself, eat, drink and be merry. But without joy, it is but a hollow success. We have never known what we are capable of together - apart from our savagery when released from cages too small. This is a brilliant post again, Simon... I am going to keep RATTLING THE CAGE with all my might. This is a disturbing read (I mean that in a good way). Yes, and more frightening to me is that if we dig around in our own pockets, often we are the ones holding the keys to our own cages, and they are locked from the inside. And often the keys are hidden from our sight.